A bad day of testing. Well, I did it. I actually went to a field and tossed some boomerangs, or would be boomerangs. mostly sticks. I had a few boomerangs I bought on ebay or received as gifts. Two were very nice performers. The four Arno Monsori boomerangs worked, but were awfully short range. I am not sure they were getting 15 meters, let alone 20. They are pretty boomerangs they just don’t go very far. 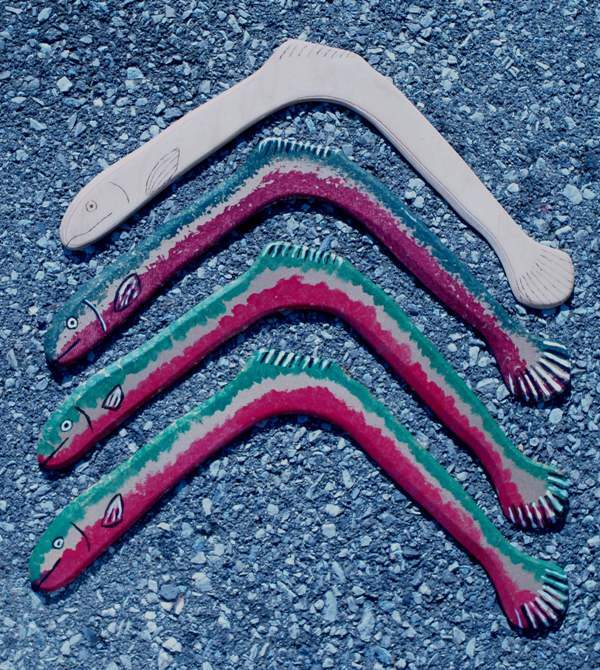 The rest of the boomerangs were ones I shaped, although most were prototypes. I had three boomerangs made from a shape that David Fantone sent me and enlarged to 110 and 120 percent. The 110% one in 5mm plwood did not make a full return, The 120% one also in 5mm actuall crashed after starting to turn left. It never laid over. The second 120% one is in 1/4 inch plywood and actually fared better than the other two, making it about 3/4 around. Next I tried a Herb Smith Sycamore which only got 3/4 back. I was surprised at the distance it got so maybe a bit of additional carving will help. I also had a Smith modified Sportsman which flew very well. Finally something that worked! I had two more boomerangs, a copy of an African woman done in both the original and a reverse image. The original was only ok but the reverse was not very good at all. I wanted to try some LDs but couldn’t find a field big enough and the wind was very low Sunday. I now have 20 LDs that need testing before I can go further with them (paint etc). Final thing: I didn’t throw for more than about 15 minutes but my right arm/elbow is a bit sore today. 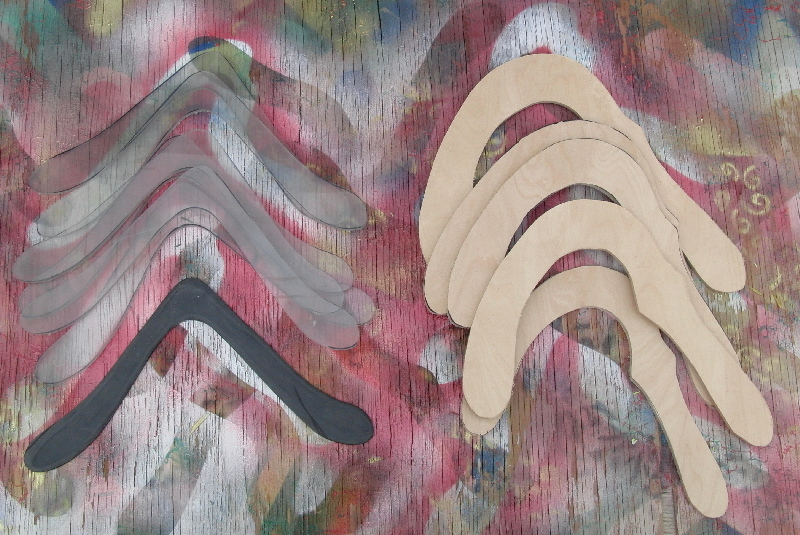 the temps continue to sneak into the high 40’s so I take any chance to make some boomerangs. The now ready to paint WindJammers got finished. I did them all the same in a metalic red color with gold stenciled swirls. From there I went back to basics to trace some polycarb blanks and plywood blanks. Then I cut them out on the bandsaw. I made these up to send to my friend David Fantone. He was out of 5mm plywood so I cut the blanks for him. Of course there are a few extras for me. After that I decided to finish off sanding the 2.3mm G10 long distance blanks I had previously cut. With the ones I did last week, I now have 14 ready to test fly wich include 3 Swish, 4 Milpas Reaper and 7 Voyagers. I think I have another 6 or 8 blanks in 3.3mm G10 to shape , but that will be another weekend. 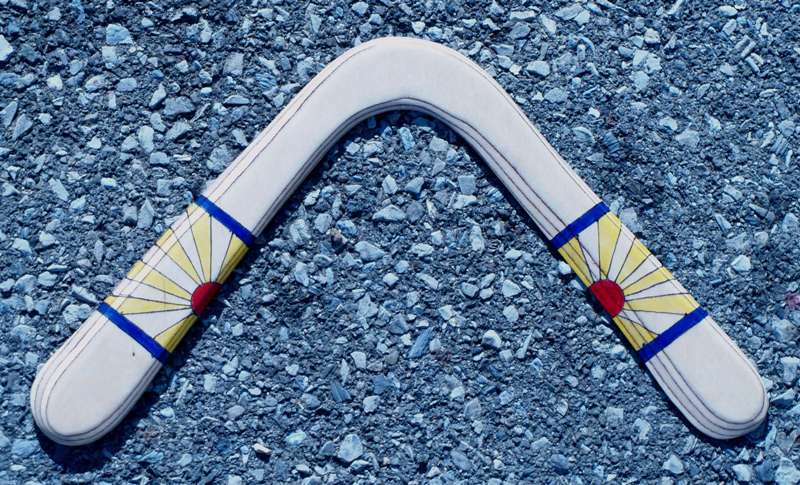 It was good to cut, sand and paint boomerangs. Maybe I didn’t do any one boomerang from start to finish but the whole process was just like doing that. 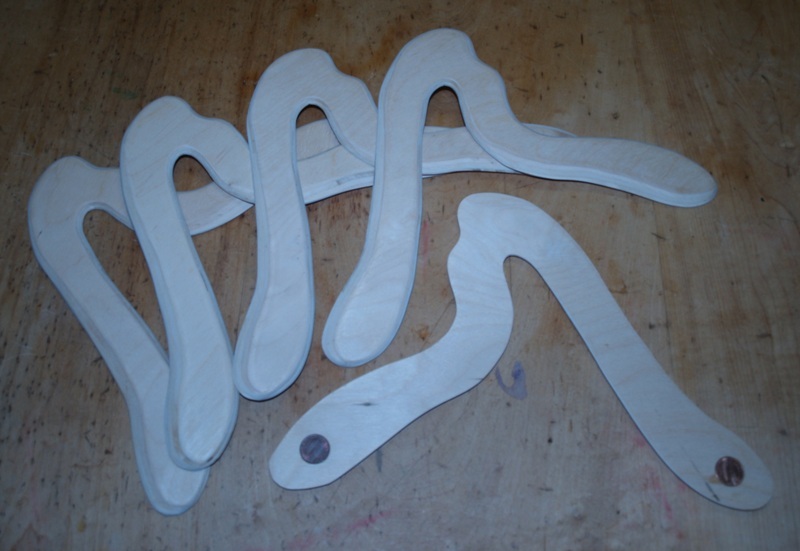 Well between the temps inching up and a bit of free time, I managed to make some boomerangs this past weekend. Of course I didn’t complete any from start to finish but did different things that added up to boomerangs. First the shaping. I managed to shape some long distance boomerangs from 2.3mm G10 fiberglass. There were two of Dave Hughes’ Swish model, 2 Voyagers in a 90% size and 2 Milpas Reapers. I like the Reaper a lot and think the thinner version will be easier for me to throw. A trip to the field will let me know for sure. Here are the shaped blanks. Next I drilled holes and weighted some Windjammer boomerangs with pennies. When I originally tested these they seemed lighter than previous versions and the extra weigh helps a lot. I did some finish sanding and these are ready to paint. 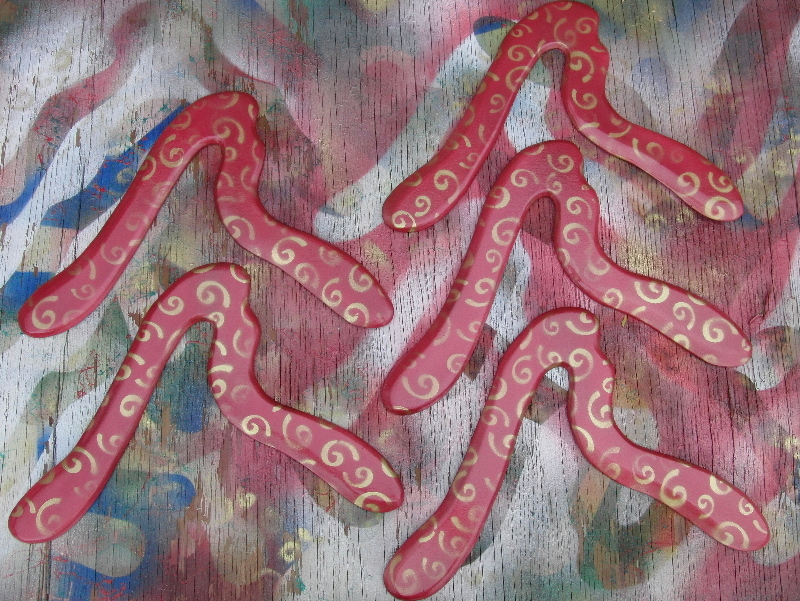 Since it isn’t warm enough to spray paint outside, I stayed inside and finished up a few more boomerangs. I had a few Rainbow Trout boomerangs hanging around and since I paint those with acrylics, they were first on the list. They came out pretty good. In the photo, the top version is my old one, which was decorated using a wood burning tool. The final two boomerangs i finished were a Veebru and a Boomerang Fever which I decorated with permament markers. Here’s the Veebru in my Rising Sun decoration. The pattern comes from two stained glass windows I have hanging in my kitchen windows. Thats it for now. Lets hope I can squeeze in some time to make more, and time to write about it. 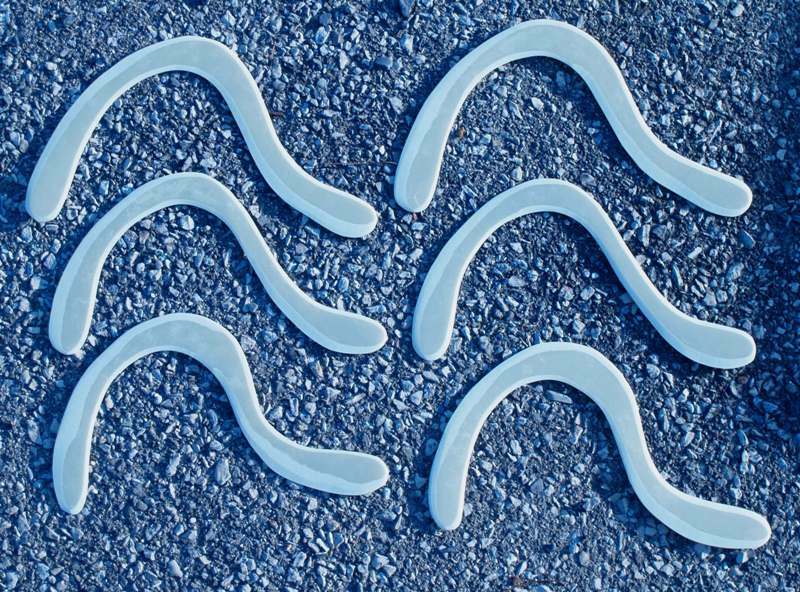 BTW, several of these boomerangs are now listed on ebay for sale.